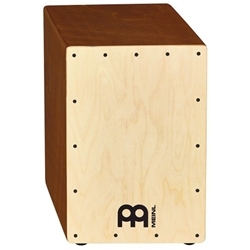 Crafted in Europe, the MEINL Jam Birch Cajon packs a powerful low end punch when played near the center and dishes out high frequency “slaps” when striking the top corners. This midsized model is slightly more compact compared to other MEINL cajons, making it easy to transport. Two sets of internal fixed snare wires brush against the playing surface to deliver a crisp, sensitive snare effect. ?